Dost thou here sleep, Judas, careless and at thine ease…as if thou knewest not that thou art the object of his hatred, and that all his other disciples he prefers to thee? ….Dost thou suppose thou shalt enjoy greater happiness in the new empire Christ is to erect? how miserably art thou deceived! Peter and the favourite sons of Zebedee, will be greater and more mighty than thee ! treasures in a full stream shall flow to them from the spacious land. All the others too shall receive from the Messiah a much more splendid inheritance than my unhappy son. Come Judas, I will shew thee his kingdom in all its glory. Rise with me: be not dismayed but arm thyself with courage, Now thou seest before thee that endless chain of mountains, which cast their lengthening shades into that fertile valley. There gold shall be incessantly dug ; gold, bright and glittering as that of Ophir: while the valley shall through the prosperous year pour forth a rich exuberance of blessings. This is the delightful inheritance of the favourite John. Those hills, covered with vineyards, and those wide-spreading fields, clothed with waving corn, the Messiah has given to Peter. Seest thou all the opulence of that smiling country, where cities rising, in lofty splendor, each like Jerusalem, the king’s daughter, glitter in the sun, and with their innumerable inhabitants extend along the vale. Behold how those cities are watered by the limpid streams of a new Jordan, which passes through noble arches in the lofty walls. Gardens. resembling fertile Eden, wave their blushing fruit, over the golden sands, on its happy shores. These are the kingdoms of the other disciples. But now, Judas, my son, observe that far distant mountainous country, wild, stony, and covered with withered shrubs. How barren, how desolate! Above it rests night in cold and drisly clouds, and beneath, on the tops of the eminences, a sterile depth of ice and northern snow. That, 0 Judas! is thine inheritance. In those gloomy, regions thou, and the birds of night, thy companions, are condemned to wander solitary among the aged oaks. With what haughty—with what contemptuous airs will the happy disciples look down on thee ! they will pass by without condescending to observe thee! Ah, Judas, thou weepest with indignation!—but in vain thou weepest!—in vain are all thy tears, while surrounded with despair, thou neglectest to help thyself! ….Do thou, therefore, deliver him into the hands of the priests….the grateful priests will not fail to reward thee for delivering up Jesus. This is the advice of a father ever attentive to thy interest. Fix thine eye upon me, and know me in spite of the paleness of death. Awake. Despise not the admonitions of a parent who is come to revive thy courage; and let me not return melancholy and dejected to the mansions of the dead. Satan having thus infected the mind of Iscariot with this deceitful vision, swelled, inflated with pride, like a mountain raised by a volcano, while convulsive earthquakes rock the neighbouring eminences, and sink the surrounding hills. Judas awoke. Furious he started up, crying, Yes, it was he—it was the voice of my deceased father!—Thus he spake—thus be looked, when before me he expired. Ah! it is then but too true that Jesus hates me! the very dead know that he hates me ! Well, I will haste and put in execution my father’s advice. The translation from the German is by Joseph and Mary Collyer (1808). I have added some paragraph breaks. 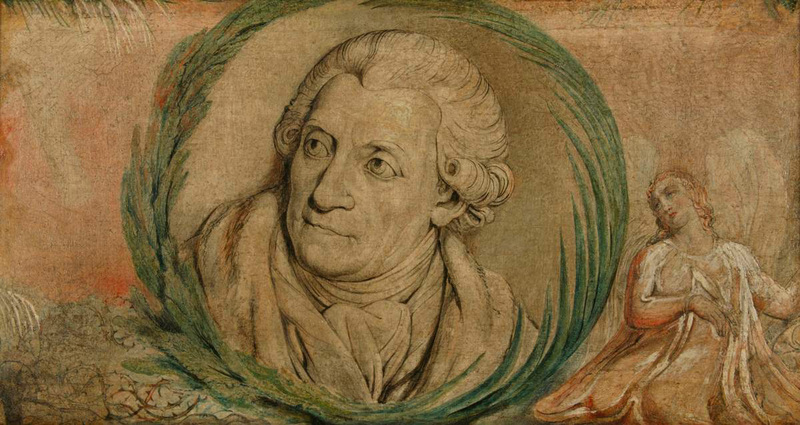 The image is an undated portrait of Klopstock by William Blake. This entry was posted in Uncategorized and tagged 18th Century, Christianity, Friedrich Klopstock, Germany, Judas, Poetry, Portraits, Printmaking, Religion, The Devil, William Blake. Bookmark the permalink.